Thanks to my hometown newspaper for a great recent article! See below for the full article. We have been in Miami for three weeks now, and finally, it’s the eve of the first ISAF Sailing World Cup regatta of the 2015 season. We have had a variety of conditions here in Miami, and it looks like this week will bring the same. We are excited to race after putting in a lot of time training and perfecting the boat over the last few weeks! Thanks to our coaches Ramon, Luther, and Grant for their time. Off the water, the time here has allowed us to work one-on-one with our strength coaches, spend lots of time with the physical therapists at Jaguar Therapeutics, get tactical coaching, and meet with our sport psychologist. 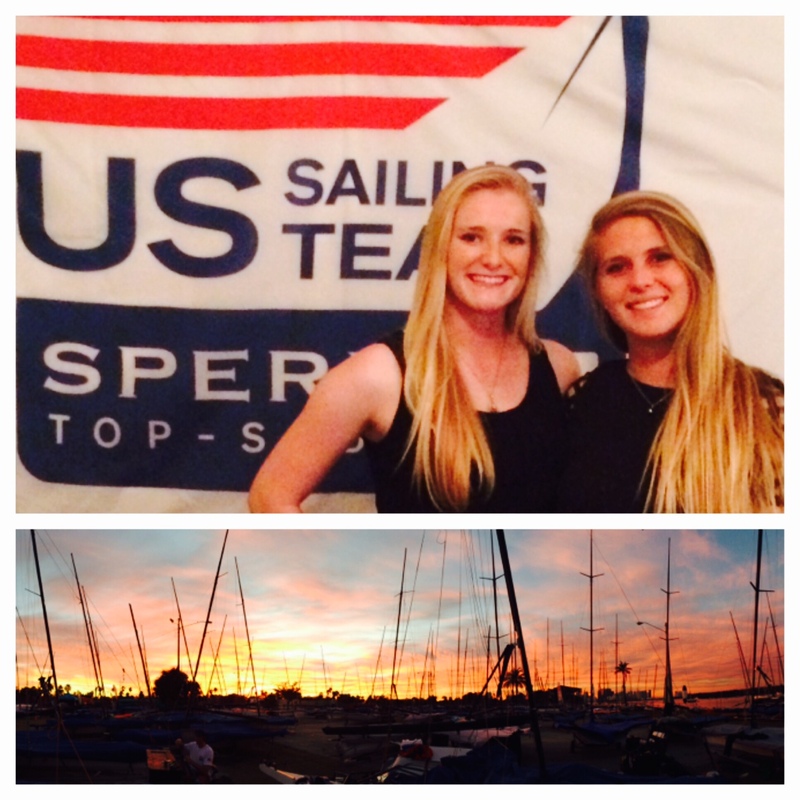 Last night we attended the US Sailing Team Sperry annual awards dinner. It was inspiring to reflect on our achievements as a US team this year and thank our sponsors, especially Sperry, Harken, McLube, and Beneteau, for their support. We’d also like to thank our incredible donors for helping to kickstart 2015. Your support is truly invaluable as we reach for our Olympic goal. We are so grateful and we think about all of you a lot! This week, check our Facebook page for updates and follow results here. You can even watch race tracking in 2D or 3D here! Wish us luck – for us, Sailing World Cup Miami is the qualifier for the Pan American Games, Rio Olympic test event, and ISAF Grand Final in Abu Dhabi. We’ll be giving it everything we’ve got! There’s no stopping Kirkland native Helena Scutt from sailing in the Women’s High Performance Skiff for the 2016 Olympics in Rio de Janeiro. Not the severe injuries sustained last year during the 2013 World Championship in southern France, nor her pursuit of a master’s in mechanical engineering at Stanford University. It’s not just about competing in the Olympics, but a chance to compete in the high performance skiff, the first time the category has been introduced in the women’s competition. It was first introduced for men at the 2000 Olympics in Sydney. Having graduated from Stanford University last June, Scutt said she planned to get a master’s in mechanical engineering but has suspended her academic career in order to devote her time entirely to preparing for 2016. Born in Cheltenham, England, Scutt moved to Kirkland with her family when she was two. Her father worked as a consultant for Boeing, and the trip was only expected to last nine weeks. Something about the area enticed them to stay. Growing up, Scutt said her father had a love for sailing, which he had done in England with his siblings, and as a young man he had qualified for Junior National team, but couldn’t afford the boat for the competition. Hoping to pass on that love of sailing to her, he took her out sailing and signed her up for sailing day camps, where she learned how to navigate a boat on her own. Initially, however, Scutt had a greater interest in soccer, which persisted until she reached high school. While running track and cross country, she also started sailing with the racing team at Sail Sand Point, a non-profit community organization at the north end of Magnuson Park in Seattle. She also raced with the Seattle Yacht Club, where her coaches, Jen and Ben Glass, taught her how to handle the 29er sailing boats she would race. Scutt also sailed along with her skipper, Katy Cenname, with whom she would sail through high school and until college. Together, they won the 2010 Seattle Yacht Club’s One-Design Sailor of the Year award, as well as the 2010 29er Pacific Coast Circuit’s Maxam Trophy for Top Female Crew. They also sailed with the 2010 US Sailing Development Team, which is comprised of sailors in the classes selected for the ISAF Youth World Championships and the Olympic Games. After graduating from Kirkland’s International Community School in 2010, Scutt was accepted to Stanford University, where she competed on their sailing team for four years on 49ers, 16 foot long boats which brought with it new challenges for her. Contrary to the perception of sailing as relaxing, Scutt said racing is anything but that. The 49er boats have no keel and require proper weight and balance to keep it from tipping on its side. During half-hour races, Scutt said, she and her fellow sailors are constantly moving across the boat to keep themselves in proper position to the wind. This requires not only precise coordination with her racing partner, but it is physically demanding. With three to four races a day, and some regattas lasting six days, Scutt said it is easy to become overwhelmed. Scutt has an appreciation for the fact that she can sail at all after an incident at last year’s World Championships in Marseille. During the race, Scutt’s boat was approaching a marker in the water that another boat had already turned around and was heading towards them. At that level of competition, Scutt said, boats often come very close to one another. This time, however, they got too close. Though they didn’t hit, the wing from the other boat struck Scutt in the side, causing both boats to flip over. Her skipper, Paris Henken, was able to help her into a motorboat their coach was piloting. She was taken to a local hospital, where it was determined she had suffered a fractured vertebrae in her spine and several fractured ribs, as well as severe internal bleeding. Above all the bodily injuries, Scutt said she was terrified it was her last race. Flying back to California, Scutt managed to complete the fall semester at Stanford. Because she couldn’t walk, let alone get out of bed without difficulty, she had a golf cart to take her to classes. Miraculously, Scutt never required surgery, and by winter break she was back sailing again. The accident also gave her a newly found appreciation for sailing, as well as determination. At the World Championship last year, Scutt and Henken took first place in their category, qualifying them for the US National Sailing Team. Most recently, they earned a bronze medal at Copa Brasil de Vela, the Brazil Sailing Cup, in December. Now Scutt trains seven days a week, four doing strengthening work, the other three concentrating on cardio and aerobics.